work, some time ago I gave up, waiting for better times. andLinux is a complete Ubuntu Linux system running seamlessly in Windows 2000 based systems (2000, XP, 2003, Vista; 32-bit versions only). This project was started for Dynamism for the GP2X community, but its userbase far exceeds its original design. andLinux is free and will remain so, but donations are greatly needed. 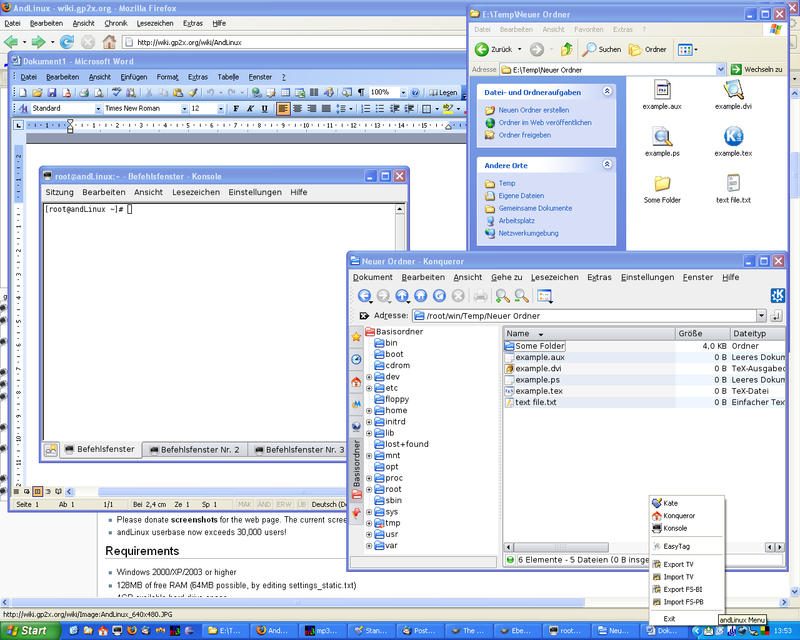 andLinux uses coLinux as its core which is confusing for many people. coLinux is a port of the Linux kernel to Windows. Although this technology is a bit like running Linux in a virtual machine, coLinux differs itself by being more of a merger of Windows and the Linux kernel and not an emulated PC, making it more efficient. Xming is used as X server and PulseAudio as sound server. andLinux is not just for development and runs almost all Linux applications without modification. Don't have much time to try out at the time but this is surely a reference worth remembering in the future. based as well on colinux. Last time I tried both products the sound worked in Ulteo but I couldn't install anything. andLinux had the sound broken but I could install nifty things like WINE. Both products seem to degrade Windows performance. Neat idea though. www.colinux.org is a remarkable program. >> |operating system, video output can be redirected to the available X server. >> | programs and so on all work at normal speed. When we can see The Cooperative Windows??? >> running Microsoft Windows on Linux natively??? That's what WINE is doing..
At best, you can use Virtual Box to run XP in seamless integration mode, it works fairly well with a dual core machine. Virtual Box emulation should be as close as possible for a coWindows for linux native hosts with a decent performance while using opensource solutions. Have you tried this method? I personally have no complaints about VirtualBox except for the initial install of the personal edition and enabling the feature to use USB devices on the guest OS. To match visual themes from gnome and XP, I use the zune theme on both and this makes both OS integrate perfectly when running linux as host. does not support 3d acceleration and OS is still vulnerable to viruses. One would have to assume that MONO would be the best way to run .Net applications under Linux, and I understand that that works quite well for anything that uses only the terminal (command line) for Input and Output... the problem is that it can't support Windows err windows, and other GUI controls. Wine would have to step in there, but since .Net is a pointless waste of time and effort on any OS and for any reason... (and because I love getting flamed ) and Wine still has some little way to go to get a full Windows x86 PE programs running, I can't see it being high on the list of priorities. Besides which, I think being able to run Windows programs on Linux makes your Linux about as vulnerable as Windows to Windows Viruses... running Windows in a Virtual Machine is safer, on either Windows or Linux... especially if you undo the disc at reboot. I keep many VMs for these purposes, accessing risky sites or p2p networks, opening eMail attachments etc. If your VM software doesn't support undo Virtual Discs, I presume you know how to use GZip on a Virtual Hard Disk file? I'm bummed about both these programs however, as I now have no 32-bit system to run them on... Except VMs, and I may as well install Linux on those. Why doesn't the CoLinux Kernel work on WOW64? Getting around the single thread would be a nice improvement. The more I read about this colinux, the more it feels just like KVM.... All the other aspects of kernel virtualization are there... Hardware control remaining with windows, filesystem being encapsulated in a single file, networking driver for the "guest", single process representing all processes in "guest"
Nevertheless, why is there so little information about something aiming to be so radical? Now what would be cool is for the kernels to each claim their own cores, and I/O to be equally shared, which is obviously going to be applicable only for trusted kernels, else contention would kill both. Edited by milindsmart, 02 September 2014 - 06:52 PM.